Kathleen Nohe is this month's Common-Thread Give-Away guest artist. 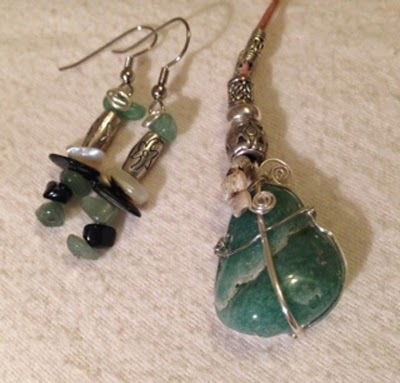 She will be giving away a sample of her wearable earth jewelry. She has a special love for the rocks of the earth and enjoys turning them into beautiful, wearable jewelry and we are pleased to showcase her, her website and work this month. This is our Common-Thread Artists' Group's way of thanking you, our readers for continuing to support our work and visiting our blogs and websites. Every month we feature an artist and their work and offer a free give-away sample of their work to our readers. We are pleased to introduce you to Kathleen. Her love and appreciation of the stones is evident in her jewelry, as is her precise and creative silver work. Do take time to view her creations on her website and share your thoughts with her. I thought it fascinating to see which of her creations "drew me in the most". They truly do have a way of speaking to the heart and soul. Hopefully, you will be the next winner of this month's give-away drawing. The members of our Common-Thread Artists Group are listed to the right. You need only to click on them to access their website. Please feel free to visit us, leave comments, or questions. We are only too happy to hear from our readers. Thank you again for your support and interest in our work. Labels: Free Give- Away. Common-Thread Monthly Give-Away Drawing. Common-Thread Artists' Group.